He could not for the life of him remember if he had closed the back door. 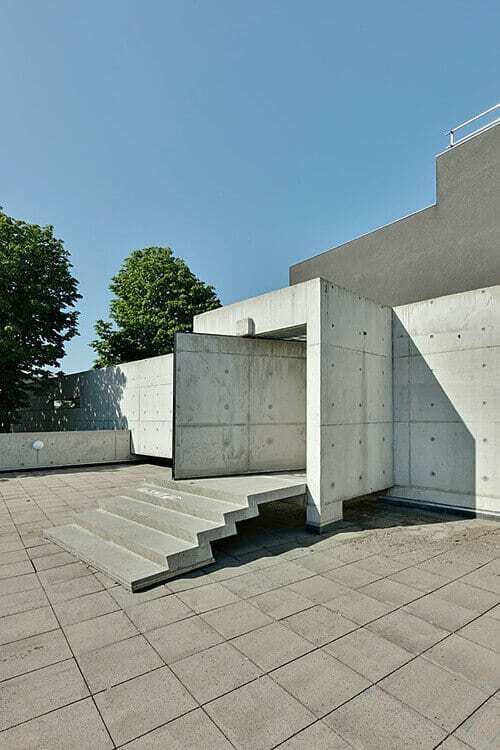 From the pivoting broad, heavy door, to the stippled appearance of the exterior itself, the designer of this structure has emulated a clinical, industrial, post-modern feel. With architecture which is big, bold, and basically colored in a weathered white, the walls of this structure alone convey clean, minimalist tones. Offset by a grey wall making a part of the structure, the paneled approach works great to form a boundary. Atop the grey you can see a steel hand railing, hinting toward a roof-top space which can only grant a view which is as surreal as the landscape itself. Moored by trees, the boundary wall extends far out of the picture, an indication of the sheer scale of this structure. The entrance and stairway are placed at a slight angle, creating a contrast and centerpiece to this otherwise linear exhibit of hipster design. One could call this creation a harmony of concrete which sets itself aside as a true spectacle amongst the surrounding lush green landscape and bright blue sky. Once that swivel door swings shut you are sure to be instilled with a sense of security and protection, given the immensity of the size of this architectural creation. Some may steer away from the rugged, all-concrete layout; however, most hipsters will agree that an exterior such as this is the perfect shell to house an ultra-modern home.